Check out the video on YouTube titled: Critters Funny Spoof. 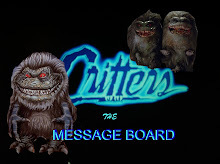 It is a short video we have discovered from a clip of critters. We at Nunca Productions are looking for some critters merchandise. We need some critters props and puppets, at a low price. We have just bought a Critters puppet for our Critters: Fresh Blood movie, but we need more if possible.